No other facial fracture can be as freighting as trauma to the bones surrounding the eye and for good reasons. Orbital fractures are invariably followed by change in vision that typically includes double vision and pain with eye movement. Timely evaluation and treatment are the only options at restoring and preserving normal visual function. How is the eye protected during trauma? The eyeball (globe) sits protected in a bed of fat and connective tissue that is in turn housed inside of a thin bony cone. Special muscles attached to the globe, assist it in moving in all directions. This arrangement protects the eye from most blunt trauma by transferring the force of the trauma first to the fat pads and secondly to the bony walls surrounding it. What happens during an orbital blowout fracture? An orbital blow out fracture is actually a protective mechanism that functions to safeguard the eyes during trauma. The force of trauma would cause an unprotected eyeball to rupture, causing permanent blindness. In order to avoid this, force is transferred to the walls around the globe. These thin walls will blow out to release the trauma force and hopefully save the eye from permanent injury. Typically, the floor of the orbit and the medial orbital wall are the bones involved in orbital blow out fractures. Furthermore, various complications can be seen with orbital blow out fractures. The fracture of any of the orbital walls can potentially lead to the widening of the cone that the eyeball sits in. This can lead to a condition known as enophthalmos where the eye has a sunken appearance. During the fracture, one or more of the muscles that are involved in moving the eye can also get trapped between pieces of bone. This will typically result in double vision and pain while attempting to look in different directions. Also, in rare instances trauma can cause damage to either the globe or the nerve that connects the eye to the brain. This will result in loss of vision and is an emergency that requires an immediate visit to the emergency room. Figure 1: The boney walls of the orbit include the lateral wall, orbital roof, medial wall and the floor of the orbit. The most common fractured wall is the floor of the orbit followed by the medial wall. How do I know if I have an orbital blowout fracture, and when should I see a doctor? Trauma to the face, especially near the eye, oftentimes results in a blowout fracture. All cases of orbital trauma or suspected orbital blow out fracture should be promptly evaluated by a facial trauma specialist. In addition, any change in vision after trauma should also be immediately evaluated. The only way to accurately determine if this injury has occurred is to have an evaluation that includes a CT scan of the head. Orbital fractures commonly cause pain with eye movement, double vision, and bleeding from the nose. Additionally, swelling, redness and bruising around the eye are likely to develop. A sunken appearance of the eye (enophthalmos) can develop days or even weeks after the fracture. A physician should be consulted if you notice that your eye has developed a sunken appearance after any previous instance of trauma. What are the treatment options for an orbital blowout fracture? The presence of any visual deficit, pain, or cosmetic change. As a general rule very small fractures that do not cause any double vision or pain with eye movement can simply be observed and, typically, do not require further treatment. Larger fractures are more likely to lead to enophthalmos, a sunken appearance of the eye, and would require repair. Also any fracture that causes double vision or pain with eye movement as a result of muscle entrapment would need to be repaired. Repair of an orbital fracture can be accomplished through various techniques and depends on the factors mentioned above: location, size and clinical findings. Some uncomplicated cases of fracture may be corrected using endoscopes that are introduced into the nasal sinuses. This method leaves no external scarring and generally has a faster recovery time. In cases of greater complexity, a fracture can be repaired through an incision made on the inside of the eyelid or just below the eyelashes, resulting in no visible scarring. A fractured wall can be repaired either by returning the existing bone to its original position or by replacing the wall with synthetic material made especially for the orbit. The best treatment of an orbital fracture is one that has been customized for your individual injury. 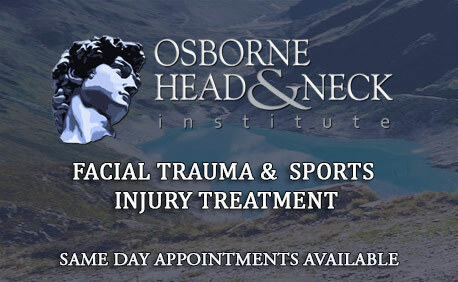 A facial trauma specialist accomplishes this through thorough evaluation of your injury and careful analysis of CT imaging. Figure 2: Picture of a patient with a right orbital blowout fracture (top). Coronal CT of the patient’s head demonstrating the blowout fracture of the right orbit (bottom). Note that the left orbit is intact and normal in appearance. Figure 3: Sagittal CT scan demonstrating a blowout fracture of the orbital floor (top) and a normal orbital floor (bottom).